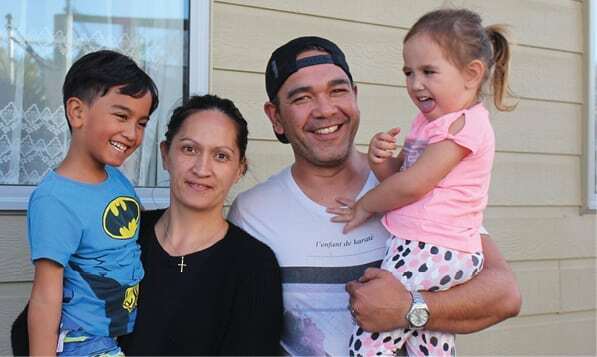 Feeling trapped in their rental situation, William and Lois Dornan and their four children partnered with Habitat for Humanity Central North Island to change things around permanently. Just before the Hamilton family was accepted for Habitat’s Assisted Home Ownership Programme, William thought they had hit rock bottom. William said they were in a cycle of renting one home after another and were unable to save for a house deposit. The family had moved several times, and being on one income, there was nothing left to put aside. To make the situation even more challenging, their house became overcrowded when family – also renting- needed a place to live urgently. “We had our nephew and his partner and their three kids move in. And then I had my twin sister’s baby as well, as she was in hospital in a coma,” Lois explained. She had a newborn baby herself and was very practical about taking her niece to breastfeed and care for until her sister got well. There were four adults and eight children in the three-bedroom home, including two babies. While William said he had lost all hope for getting a place of their own, Lois believed it was possible – her parents had owned the home she grew up in. And she said her strong desire to give her children a “homestead to always come back to” helped to keep her mind strong and keep searching for opportunities. Then she heard about the Assisted Home Ownership Programme with Habitat for Humanity. The next house was going to be built in Hamilton, and Lois went to an information session to hear all about it. She decided to apply. It was a couple of months later when Lois phoned William to ask him to pick her up because of a flat tyre. William rocked up to the location of instruction and when he got there, Lois pointed to a bare piece of land and said “this is where our new house is going to be.” William said he almost cried. And so their journey began. With the help of many volunteers, family and friends, the Dornans built their house alongside Habitat. Helping to build your own house is one of the criteria for taking part in the programme. Every hour of work counts towards the 500 required hours of ‘sweat equity’. Sweat equity is part of Habitat’s ‘a hand up, not a hand out’ philosophy. The charity doesn’t give homes away and families work hard to help themselves. In addition to sweat equity, families make affordable repayments. Habitat for Humanity Central North Island’s General Manager Nic Greene said the programme is a rent-then-buy model. Help to build up a deposit was exactly the type of help the Dornan’s needed and they took the opportunity with both hands. They purchased the home from Habitat before the five-year term had even ended. “We weren’t mucking around,” said Lois. William got a promotion at work and once their little children were old enough, Lois arranged her mother to babysit and she started working as well. Now their partnership with Habitat has come to an end, William and Lois reflect back on how they’re feeling compared to five years ago. And like many New Zealand families who rent, they remember the insecurity and fear of having to move out any time, and how this has changed to stability and being in control. “There is no more fear of ‘you gotta move out’, that always sits in the back of your mind. Decisions we’d made in the past were based on the fact that we were renting and that we could move. “It feels like we are more permanent now,“ William said. This stability also positively impacts the children’s education. Home ownership has shifted the focus from securing a place to live to thinking about what they can do in the future. And owning a business is one of these things, William said. Last night William and Lois had an unexpected visitor. Their oldest son who had recently moved out stood on the doorstep with his bags. The return of their grown-up child – who they thought had flown the coop – came with mixed thoughts for Lois.